On June 6, City Council approved a contract with a team of consultants to help update Oakland’s bicycle plan. Oakland’s first bicycle plan was adopted in 1999, as part of the Land Use and Transportation Element of the City’s General Plan. The 1999 plan was revised in December 2007 (see below), and then reaffirmed in 2012. A current, approved bicycle plan is required to be eligible for certain State funding opportunities and by the Alameda County Transportation Commission for local jurisdictions receiving Measure B/BB funds. This revision will: update the Plan’s vision, goals, and policies; document existing conditions and current best practices; plan a network of high quality bikeways serving "all ages and abilities;" establish a methodology for measuring the quality and connectivity of bikeways; and develop an action-oriented plan for increasing bicyclist mode share, decreasing bicyclist crashes, and improving the quality of bikeways. 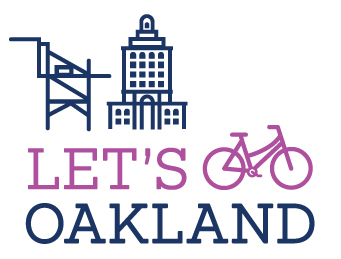 The Plan, tentatively titled "Let’s Bike Oakland," proposes outreach and engagement that includes several workshops, multiple mobile workshops and bicycle tours, and a statistically relevant survey questionnaire. Additionally, local organizations will be hired to support community-based outreach. The bike plan update is funded by the Transportation Development Act, Article 3, a portion of the state sales tax set aside for bicycle and pedestrian projects, and distributed to cities based on population size. For more information, see www.letsbikeoakland.com. Oakland's Bicycle Master Plan is the citywide, long-range policy that promotes bicycling as a viable means of transportation and recreation in Oakland. Adopted by the Oakland City Council in 2007, the Plan was funded in part by a grant made possible by the Alameda County Measure B half-cent transportation sales tax, administered by the Alameda County Transportation Improvement Authority (ACTIA), now part of the Alameda County Transportation Commission. The Plan reflects a detailed analysis of the Proposed Bikeway Network. This analysis led to proposals for maximizing bicyclist safety and access while minimizing adverse effects on other roadway users. What's Included in the Bicycle Master Plan? Print copies of the Plan are available from the Planning & Zoning Division, 250 Frank Ogawa Plaza, Suite 3341. Or call (510) 238-3911 to order a copy. The Plan is also available in .pdf format. The Plan must be updated or reaffirmed every five years for the City to remain eligible for funding from the State Bicycle Transportation Account. The next update process is expected to begin in 2011. For more information, you may download these documents in .pdf format. Maps - Seven, 11" x 17" maps (5.7mb) including Existing and Proposed Bikeway Network, Bicycle Mode Share by Census Tract, etc. In creating the Bicycle Master Plan, the City benefited from continuous involvement by a Citizens Advisory Committee and proactive outreach to neighborhood groups, merchants associations, and community-based organizations. The Citizens Advisory Committee was composed of representatives from each council district, representatives of community-based organizations, and other interested individuals. The 20-member committee met monthly from April 2005 through November 2007. Throughout the process, the project manager gave presentations to neighborhood groups and merchants' associations. More than 50 presentations were made, reaching more than 850 people throughout the city. Three large format, open-invitation public meetings on the project were held: two in June 2005 at the beginning of the process, and a third in April 2007 to coincide with the release of the Draft Plan.